Marilyn Leahy (B.S. '91/E; M.Ed. '95/E; M.A. '95/H&S) credits Virginia Commonwealth University for the many professional opportunities she's enjoyed throughout her career as an educator. Her path to the field of education, though, began on the MCV Campus, where she worked as a technologist with a board certification in electromyography. "During an exchange program, 10 Japanese neurosurgeons needed help teaching their families English as a second language, and I taught the classes," Leahy said. "Since I'd interrupted my undergraduate studies to work full time on the MCV Campus, I thought I might go back to VCU later and get a degree in adult education or education." Go back she did, and Leahy was in the last class of the VCU School of Education's instructional occupational education degree program, which she completed 19 years after entering. "My VCU colleagues often thought to recommend me for special projects and assignments," she said. 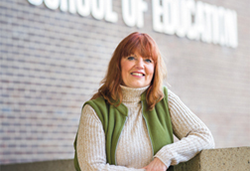 "There are so many positive ways that the School of Education has influenced my life, both professionally and personally, and so many opportunities opened to me because of the school." In a generous display of gratitude, Leahy has named the VCU School of Education as the sole beneficiary of her estate. "I don't have children so it's nice that I'm in a position to do this, but you don't have to have a lot to give a lot," she said. "Everyone has something to offer. VCU is responsible for the strategic plan for the future. A university and an education: That's our foundation." When the time comes, Leahy's generous bequest will support the School of Education's most pressing needs at the time.